MicroRNAs (miRNAs) are important regulators of adaptive and maladaptive responses in cardiovascular diseases and hence are considered to be potential therapeutical targets. However, their role as novel biomarkers for the diagnosis of cardiovascular diseases still needs to be systematically evaluated. 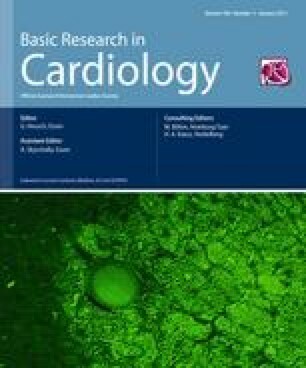 We assessed here for the first time whole-genome miRNA expression in peripheral total blood samples of patients with acute myocardial infarction (AMI). We identified 121 miRNAs, which are significantly dysregulated in AMI patients in comparison to healthy controls. Among these, miR-1291 and miR-663b show the highest sensitivity and specificity for the discrimination of cases from controls. Using a novel self-learning pattern recognition algorithm, we identified a unique signature of 20 miRNAs that predicts AMI with even higher power (specificity 96%, sensitivity 90%, and accuracy 93%). In addition, we show that miR-30c and miR-145 levels correlate with infarct sizes estimated by Troponin T release. The here presented study shows that single miRNAs and especially miRNA signatures derived from peripheral blood, could be valuable novel biomarkers for cardiovascular diseases. The online version of this article (doi: 10.1007/s00395-010-0123-2) contains supplementary material, which is available to authorized users. This work was supported in parts by funding of the German Ministry of Research Education (BMBF 01EX0806) and by grants from the Postdoc-Fellowship of the medical faculty of the University of Heidelberg. A. Keller and A. Borries are employed by febit biomed GmbH. All other authors declare that they have no conflict of interest.